Before setting off for Belarus, read this travel guide to be able to experience this beautiful country better. Belarus is an impressive city that will welcome you with its virgin nature, clean air and favorable climate conditions. It is also known as the ‘lung of Europe’ and Belarus is actually a perfect country to energize you thanks to its richness in natural resources. While you are in Belarus, relaxing activities like riding a bicycle, jogging, riding a horse or boat trips will offer you a calming vacation. You will be lost in numerous natural lakes, rivers, forests and rare plants. If you visit the villages, you will have the chance to experience both the rural life with difficult conditions and luxury at the same time. You can also join the festivals if you are lucky to be there in those times. Belarus hosts so many festivals during the year like Koliada, Kupalye or Maslenitsa. And also the Belarusian Cuisine is more than worth trying. The history is alive in Belarus. The architecture of the cathedrals, churches are just fascinating just like the historic battlefields. Belarus is one of the countries that witnessed the World War I and the monuments in commemoration of the war are also worth seeing. During the year the country hosts the chivalry tours that draw international attention. 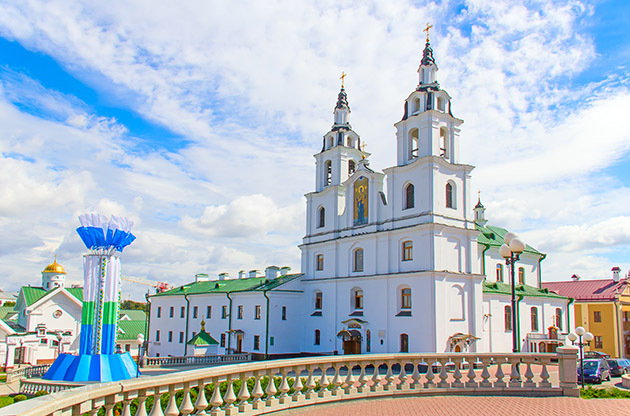 Briefly, Belarus is a matchless country in the middle of the Europe offering its visitors an oasis for breath-taking history and gorgeous nature. Belarus is located in Europe circled with Lithuania, Latvia, Estonia and Poland, Ukraine and Russia. Polotsk is the oldest town in Belarus that was founded in 862 and it is located 250 km away from Minsk, the capital of the country. Between X. and XIII. Century, Polotsk was the centre of Polotsk Duchy. This birthplace of many reputable Belarusians, Polotsk has always been a center of attraction. Today, Polotsk is known for its attraction river, River Western Dvina, the Cathedral of Saint Sophia, Boris’ Stone, Epiphany Monastery, Red Bridge and the museums. Polotsk was chosen as the Capital of Culture of Belarus thanks to its historical and cultural richness. You will have the chance of seeing many historical buildings from 12th century and after as well as fascinated by the perfect nature. So a Belarus trip is never complete without a visit to Polotsk. Agritourism is one of the most popular activities among the tourists in Belarus. Because the virgin nature with matchless colors, agricultural fertility and its enjoyable farm tourism estates makes Belarus a wonderland for a rural trip. You can go hunting, cycling, horse-riding, picking berries or mushrooms, fishing during your trip to rural towns of Belarus and experience the rural life, visit ethnographic museums, or the Belarusian traditions. When you decide to take on an eco-trip, there are more than 2000 agritourism estates that can serve you. Most of them has traditional Belarusian style however some of them reflects the modern eco-style. You can join the peasants for feeding animals, baking breads or mowing hays. You will also get the opportunity to be enlightened about traditional Belarusian recipes or Belarusian rural way of life. Nesvizh Castle is the residential castle of Radziwill family that was a prominent figure in recognition of culture, military, politics in the history dating back to 13th century. This fascinating building is from XVI. century and it is now one of the most popular landmarks in Belarus. The UNESCO World Heritage Site castle is encircled with the ponds on the river of Usa offering a picturesque view to the visitors. Nesvizh Castle is the most beautiful palace in Belarus with its ornamental lakes, flamboyant gardens and glorious inner side. It went under a restoration and in 2012 it reopened its doors to its visitors. To learn more about how to reach the castle, you can visit the official website of Nesvizh Castle. Shopping in Belarus is a joyful experience since you can find many unique products at reasonable prices. If you want to make a list of what to buy from Belarus for your family and friends, the bullet list below may help you. Matryoshka doll – They are originated in Russia but many varieties of it can also be found in Belarus at more reasonable prices. Before visiting Belarus, you can check the official website of Ministry of Foreign Affairs of the Republic of Belarus to learn more about the visa requirements. Belarus, located in the heart of Europe, is the center for many international academic and business events like conferences, congresses, trade fairs, exhibitions and symposiums. Each year, hundreds of remarkable events are held in the cities of Belarus and all of them draw international attention. There are many large-scale event venues in Belarus such as Minsk Expo, Belexpo Fairground and Minsk National Exhibition Centre all of which meet the world standards.